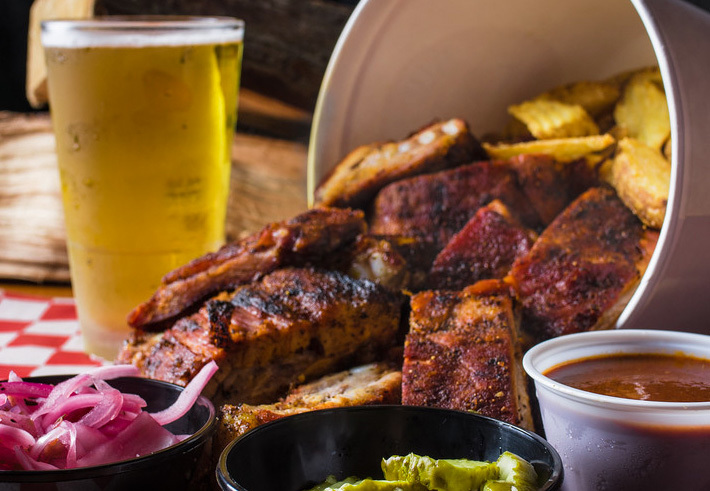 Famous Dave's has earned its place as a nationally recognized Family-Friendly BBQ Restaurant with award-winning flavors. But did you know, every Chicago location is dedicated to supporting the community they serve their amazing barbecue in? 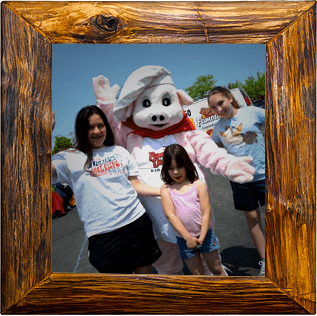 Famous Dave's Chicago gives back to the community through sponsorships, donations and fundraisers. Then, our Pitmasters hand-apply our fresh dry rubs before slow-smoking them in a live-wood smoker stoked with genuine hickory logs. To lock in that deep-down smokiness, each tender cut is finished on the grill, creating our famous char-grilled sweetness on the outside. Our tender, juicy ribs and chicken are amazing straight from the grill or topped with one of our award-winning sauces. It's the best darn BBQ you'll taste in Chicago! "If you want to go somewhere with good food and a staff that makes you feel truly special, this is the place! Yes, it's a chain, but everything we ordered was fun, fresh, abundant, and delish! Our server, Samantha, was helpful and anticipated our every need. The manager visited our table and welcomed us sincerely. Lots of perks for first-timers! The one-person sample platter was huge... brisket, chicken, ribs, corn on the cob, slaw, fries, and a corn muffin. All sooooo yummy. Go and have a good time!" If you're from Chicago, you know what it takes to make authentic Southern style BBQ. We're talking about genuine ribs and brisket smoked low and slow in a real smoker, grilled chicken and hot links, not-to-mention rich and hearty home-made sides and desserts. 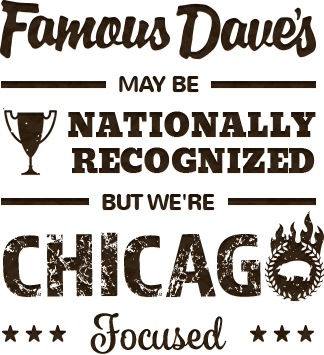 If you're looking for this type of BBQ- Chicagoland's best barbecue, you need to check out Famous Dave's in Chicago. 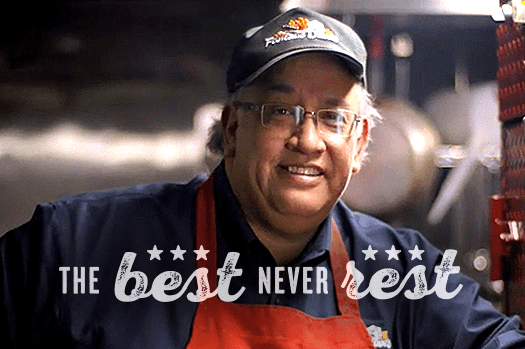 Famous Dave's is known all over the country for thick-cut, sweet smoky meats and award-winning sauces. You may have even enjoyed our amazing flavors at the Chicago Gourmet, where we fire up our Battlewagon and serve up our pulled pork sandwiches, ribs, brisket, cold drinks and sides. So, why not bring your gang to Famous Dave's in Addison, Bolingbrook, Orland Park, Oswego or North Riverside, and enjoy an entire meal in a fun family-friendly restaurant? 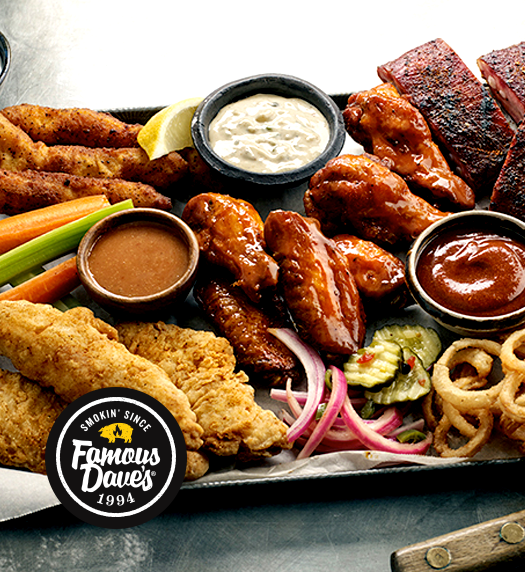 Famous Dave's BBQ is the kind of food that can be served anywhere. We've catered some of Chicago's most memorable weddings and office parties. 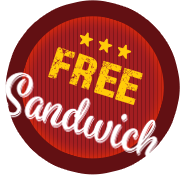 You can pick it up, we can deliver it, heck, we can even set up and serve your buffet line! But you don't need a special event to enjoy great barbecue any time of the year! We've packed up meals for picnics at Navy Pier, Millennium Park and Soldier Field. And, with our curbside pick up, you can order Chi-town's best barbecue and pick it up on your way home from work or even during a lunch break. Whenever you get a hankering for that sweet smoky goodness and sides like mom used to make, give us a call for great barbecue catering in Chicago. We'll get it ready for ya!